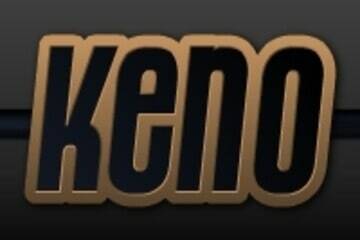 Keno is a lottery style game that is found in nearly all land based casinos. You might even find this game in bars and restaurants in some casinos, so you can play along whilst you are having a drink, or enjoying your burger. With its low profile, lottery style structure, Keno is the last game that you will ever think of playing at the casino – until you actually start playing it. The history of the game is somewhat vague, but it is assumed that Keno originated in China and even funded the construction of the Great Wall. Due to its unimposing nature, Keno did not fare as well as some other games that came from the East, however, you will always find a quiet corner at a casino, packed with Keno players scribbling away on their little paper tickets. The reason is simple - the game may not be as cool as Baccarat or as intensive as Roulette but is it known to slowly get under your skin – once that happens, you may find yourself seriously hooked up and heading straight for the Keno lounge each time you visit a casino. The objective of the game is to guess which of the numbers displayed on the board will be drawn. The players can select a maximum of 15 numbers from the 1 – 80 range and place their wager before the random number generator is initiated. Once the players decide on the numbers, they will submit their tickets and chips to the cashier, who will in turn provide them with a ticket copy. The more numbers you manage to guess, the higher the payout – as simple as that. The payout table in Keno is organised according to spots or successful matches. The lowest payouts are awarded to 1-spot games, where the player managed to match only one number. If there was no matches at all, some casinos offer a bonus play. Ten spot games will bring the highest payouts, which can amount in hundreds of thousands of dollars. If you have to ask, you clearly have not tried it. In case you are not convinced that the steady pace of the game will be engaging enough, the potential payout is sufficiently enticing to persuade any player to at least consider giving Keno a try. Unfortunately, higher payout odds equal higher house edge – approximately 30% - but with a payout potential that Keno offers, some sacrifices have to me made. Where can I play Keno? Rumour has it that some land based casinos, especially Las Vegas Strip venues, are slowly eliminating their Live Keno offer, replacing it with Video Keno booths. Live Keno is still not impossible to find and casinos such as Flamingo and Bellagio are keeping the tradition alive by providing their visitors with both of the Keno variants.